SEOUL, Aug. 31 (Yonhap) — There was much a-running about nothing for South Korea as they were held to a scoreless draw by 10-man Iran in their World Cup qualifying match on Thursday. 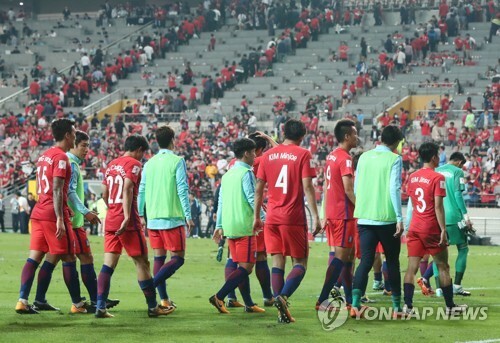 A win at Seoul World Cup Stadium could have sent South Korea to their ninth consecutive World Cup. Instead, South Korea remained in second place in Group A of the final Asian qualifying round — the last automatic qualifying spot — with 14 points, two ahead of Uzbekistan with one match to play. Iran have long secured the top spot. Only the top two teams from Groups A and B in Asia directly advance to the World Cup, while third-place teams must go through playoffs. And as fate would have it, South Korea and Uzbekistan will collide next Tuesday in Tashkent with a World Cup ticket at stake. South Korea can join Iran with a win or a draw. Uzbekistan were upset by last-place China 1-0 on the road. But unless South Korea improve their inefficient offense from top to bottom, getting past reeling Uzbekistan won’t be an easy task. Against Iran, South Korean players were quicker to control loose balls and a lot more active on the attack than their opponents. But neither their edge in total shots nor superior ball possession stat led to a goal. It wasn’t so much the inability to finish around the net that undid South Korea because, for all the running the forwards and midfielders did, they had very few dangerous chances deep in the zone. The first opportunity came in the 17th minute as Son Heung-min’s low free kick went off the leg of an Iranian player and rolled out of play. Two minutes later, midfielder Jang Hyun-soo nearly headed home the opening goal but the attempt bounced wide of the net. And that was really the extent of South Korea’s offense. Even after Iran went down a man seven minutes into the second half, with Saeid Ezatolahi stomping on Kim Min-jae’s head after an aerial battle, South Korea failed to exploit their edge. If anything, because the players had covered so much ground in the first hour or so, they visibly tired in the final stretch. Two veteran forwards, Kim Shin-wook and Lee Dong-gook, came off the bench in the second half but didn’t nearly have enough time to make any contribution. Before the match, South Korean head coach Shin Tae-yong said he wanted the team to play a “tiki-taka” style of football. It’s a brand largely defined by short, quick passes and movements away from the ball and maintaining possession. South Korea made 410 passes, compared to Iran’s 297, and had 68 percent accuracy, with Iran making good only 56.2 percent of their passes. But for the most part, South Koreans didn’t show much poise or composure when they had the ball in the offensive zone. Much of their offensive buildup was also predictable, with midfielder Kwon Chang-hoon trying to send Son free up the middle or fullbacks sending crosses from either side, only to have them cleared away easily. Iran were much more efficient when they did have the ball, and South Korean defenders at times looked flustered while trying to contain their physical opponents. The magnitude of the match alone created a sense of occasion that excited more than 63,000 fans on hand, but the quality of play on the field failed to match their expectations.